If you’ve picked up a book on the Tongass or timber or even just Southeast Alaska, the story of the trees of Prince of Wales Island is probably one with which you’re familiar. But even for an outsider, the story would be hard to miss, as the history of this island has been carved into its mountainsides. One does not need to have spent much time there to recognize: this land and logging have intimately known one another. Traveling around the island by plane, car, and boat this past week, I saw before me a history etched in wood, a past laid bare by the felled trunks which often seemed to outnumber standing trees. But while I saw many scarred mountainsides on Prince of Wales Island, I also felt hope – hope that the manner by which this land was logged can serve a cautionary tale; function as an instructive story of misuse; and issue a warning – and wake-up call – to present and future generations of the costs we all pay when an unrenewable resource such as old-growth forest suffers reckless abuse as opposed to measured use. It was beginning in the 1950s that many of the old-growth stands of the island began meeting with the former fate, logged swiftly and carelessly to provide raw material for the newly built pulp mill in Ketchikan. Flying over the forest in 1954, Art Brooks, logging manager for the Ketchikan Pulp Co., was to exclaim, “As far as the eye could see there were trees, trees, trees…nearly all virgin timber.” That is no longer the case. Of the 140 by 45 mile island, only a few places have been spared the saw. I was lucky enough to visit one of them, the southern tip of the island, this past week. Black bear we saw catching fish at one of our campsites. 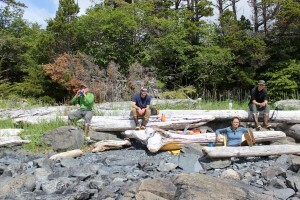 For eight days, I, along with a group representing SCS, SEACC, the U.S. Forest Service, and HCA (the Hydaburg Cooperative Association), traveled around South Prince of Wales Wilderness, one of the most remote wilderness areas that Southeast Alaska has to offer, monitoring visitor use patterns. 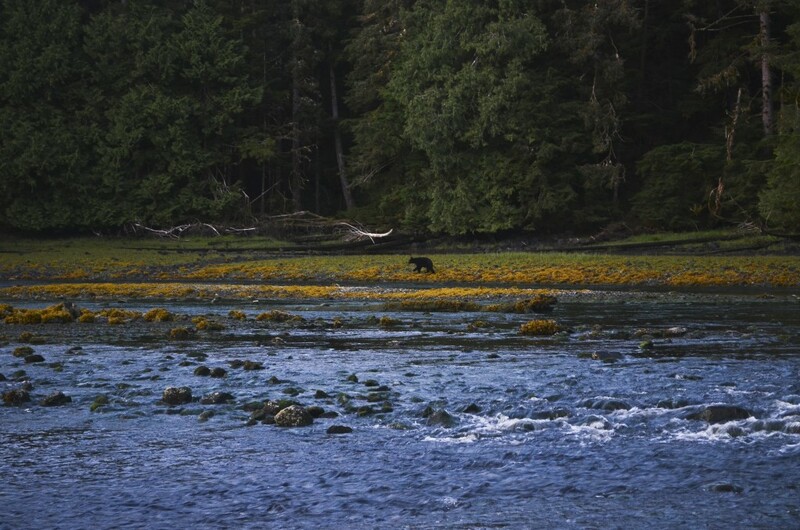 Along the way, we were fortunate enough to catch sight of whales and bears, watch the wonder that is salmon swimming upstream, be shown around an abandoned Haida village, and stand in the presence of trees hundreds – if not thousands – of years old. And aware of the past of this place, the contentious story of this space, I did not take getting to gaze at these ancient trees lightly. Knowing that this land has been a battleground for environmentalists for over half a century, that these forests are standing due to the hard work of many defenders, I felt privileged to be in their presence. But mindful that their present preservation was no guarantee of future conservation – the Big Thorne timber sale further north on the island standing as a testament to as much – I also began thinking about my own role to be had in speaking for these trees. A few days before heading out on this trip, I had been having a conversation with someone who, when my job with the conservation society came up, laughed and said, “Oh, so you’re part of the cult.” When I asked what he meant, he spoke fairly disparagingly of environmentalism in general, asserting that environmentalists rarely understood their own agendas, merely mindlessly subscribing to whatever mentality happened to be dominant within conservationist circles at the time. Although initially affronted, I am, in retrospect, thankful for the encounter, as it reminded me that it’s only when our beliefs are challenged that we take the time to reexamine, analyze, and crystallize them. 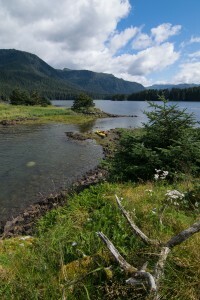 As so, thinking of my parents soon flying into Sitka for a visit, and the many times as a kid they had read The Lorax aloud to me, I set out to articulate exactly what speaking for the trees means to me with regard to the Tongass National Forest. 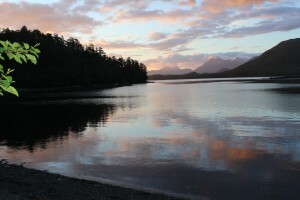 And after having spent a week out in the wilderness, observing the natural connections that govern life in the Tongass, it becomes immediately apparent that just as with Dr. Seuss’ Truffula trees, speaking for the spruce, hemlock, and cedar of Southeast Alaska involves speaking for a lot more. It’s speaking for the salmon we saw jumping upriver, who rely on the trees for the enrichment and stabilization of their spawning streams. It’s speaking for the deer we saw foraging on shore, who make their homes and secure their food under the cover of these trees’ canopy. 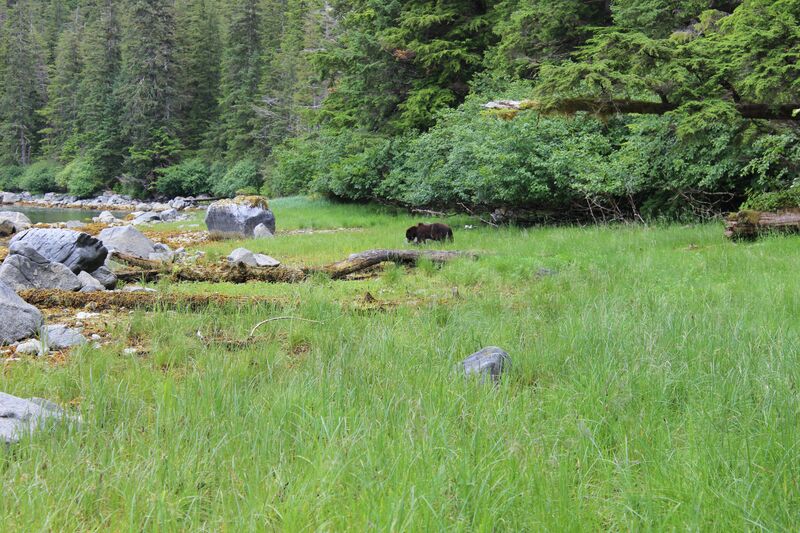 It’s speaking for the bears we saw catching salmon, who depend on the forest to protect their food source of fish and fawns. It’s speaking for the eagles we saw flying overhead, who make their nests and raise their young in the trees. And it’s speaking for the people who catch those fish, hunt those deer, and enjoy the multiple other uses to which wilderness can be put. We are all intricately connected. It may be important at times to see the forest for the trees, but it is just as important to sometimes, both literally and figuratively, see the individual trees as well – see all the organisms and associations that make up the forest and appreciate that the parts are, indeed, what make up the whole, and if we misuse one, we endanger them all. 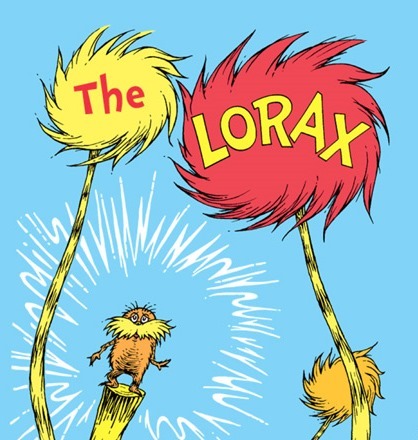 In its message of interconnectedness and warning against environmental abuse, Dr. Seuss’ fable of the Truffula trees thus seems perfectly able to translate to the Tongass. There is only one point on which I might challenge him: having seen them, having stood in their presence and felt the reverence, awe, and humility they are able to inspire, in some ways, it seems, the trees of Southeast can also speak for themselves. If you’re interested in hearing more about our work, or are looking to get involved with wilderness stewardship and the preservation of our wild places, be sure to check out SCS’s wilderness page here. Thanks and photo credit goes out to Luke A’Bear, one of the SCS participants, who was amazing at taking photos out on the trip. 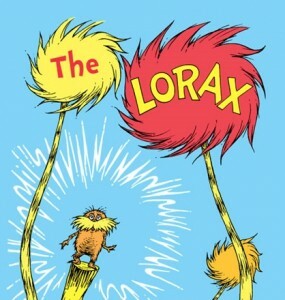 The Lorax image remains the property of Dr. Seuss. The next time I go for a walk in the woods, I’ll be sure to pay attention to the ground beneath my feet. Along with the trees lining it, and the birds flitting above it, and all the animals that may amble across it, a trail itself deserves attention. As easy as it is for you to walk it, that’s how hard someone worked on it. I know this now from experience. The crew sitting out on the deck for our boat ride up to White Sulphur. I spent this past week out at White Sulphur Springs, working with the Forest Service cabin and trail crew and a group of SCS volunteers to repair an old trail that had fallen into disrepair. 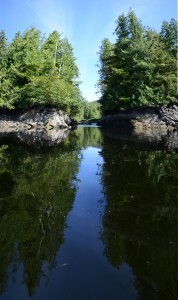 For those not familiar with the area, White Sulphur lies within West Chichagof-Yakobi, designated wilderness in 1980, and derives its name from the naturally occurring hot springs to which it is home. If there was ever a perfect place to first experience trail crew, White Sulphur was it. At the end of a hard day, what better way to calm aching muscles than by sliding into a warm tub, the whole time gazing out at an uninterrupted panorama of alternating mountain and ocean? 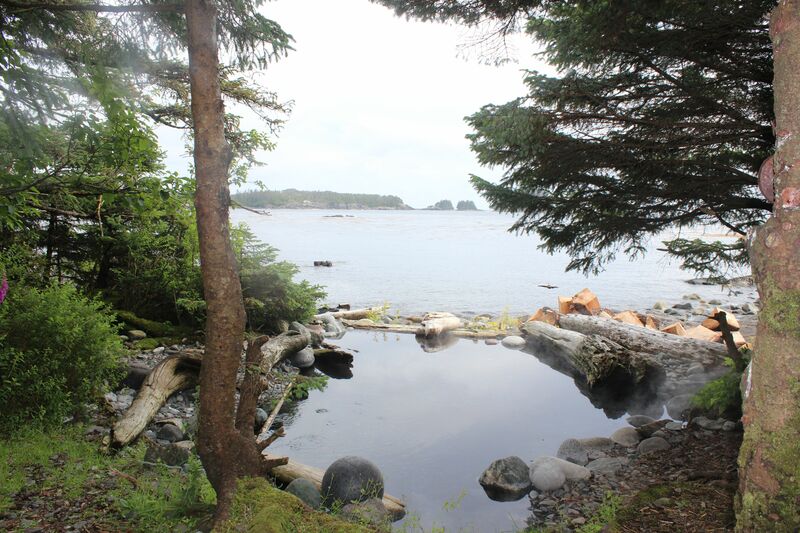 Hot spring overlooking the ocean. Paul Killian hauls a load of gravel. Yet while we relaxed at night, the days we worked were long. 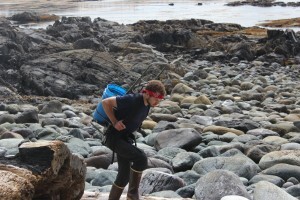 At it by 7:30 every morning, the next nine hours were spent carrying rock, hauling gravel, sawing logs, digging steps, constructing bridges, and brushing overlying vegetation from the trail. It was hard work, but equally rewarding. A week ago I had never even seen a crosscut or heard of a Pulaski. I now know how to use both, along with a slew of other tools. But in addition to the technical skills I gained while building trail, what I most appreciate about the trip is that it allowed me to experience and engage with wilderness in a completely new way. People who take issue with wilderness often level the charge that it’s wasted space, that it’s land that’s been cordoned off from humans, that it leaves no place for people. But what I saw out at White Sulphur was quite the opposite. Far from being a place that excludes people from the land, I saw the extent to which the wilderness can facilitate positive human interaction, can foster camaraderie and companionship. These things I felt with my fellow crewmen, with the individuals we met out there who thanked us for our hard work, and even – on a more abstract level – with the many people who I knew would in the future walk this trail, enjoying the product of our labor. Thus, although wilderness, by definition, is a place “where the earth and its community of life are untrammeled by man,” wilderness’s definition by no means completely excludes man. People, when exercising respect, need not be seen as antagonistic or antithetical to these places. To the contrary, I conceived of our work at White Sulphur as being to the benefit of both people and place. Mending a trail system begun over 75 years ago by the Civilian Conservation Corps, we were making it easier for people to come to, have contact with, and care for these wild areas. Thus, within wilderness, within these “areas where man and his works do not dominate the landscape,” there clearly remains at least some room for man. Still, people often take issue with the 1964 Act. In particular, I have often heard people, even ardent supporters of wilderness, angry over the line in which man is defined as a “visitor who does not remain,” arguing that man should not suffer exclusion any from these places. But to make this critique seems, at least to me, to ignore the broader context of the act, in which wilderness is being designated and defined as public land. And put into conversation with the notion of “the public,” the definition of wilderness starts to seem less restrictive, less exclusive, less qualitatively different than other public spaces. Think of the last public park or beach you were at. It probably wasn’t open all hours of the day, and if it was, there were most likely, at the very least, some rules or restrictions posted. And that’s because public space – be it a road, a park, or a wilderness area – does to some extent require the monitoring and control of human use. It’s not meant to exclude. Rather, it’s how the preservation of these places into perpetuity can be ensured. Thus, when it comes to the definition of wilderness and man’s place in it, it strikes me as a glass half-full or half-empty situation. You can interpret the law as having written people out of wilderness, or you can see it as having explicitly written people in, allowing and inviting man to visit and enjoy these places. What I saw out at White Sulphur was unmistakably the latter. It was people experiencing not exclusion from the land, but communion with it, working hard at a trail so that others will similarly be able to experience such harmony between self and space, person and place. The crew goes for a hike and explores Sea Level Slough. Be sure to visit the wilderness page of our website for more information on upcoming trips! This residency with the Alaskan Voices of the Wilderness Program was Ray’s first visit to the state, so although a newcomer to Sitka myself, I tried over the course of the trip to communicate as much about the history of the land as I could. We discussed logging and the pulp mills, and SCS and ANILCA, and talked more generally about the allure of this landscape and the unique relationship between the Alaskan state and the American wild. It was while telling Ray the specific story of South Baranof though, and its particular path to wilderness designation, that I was struck by how fitting a place it is to hold the artist-in-residency trip; and that is because South Baranof provides the perfect example that you don’t have to be a conservationist by trade to care for the earth or embrace an environmental ethic. 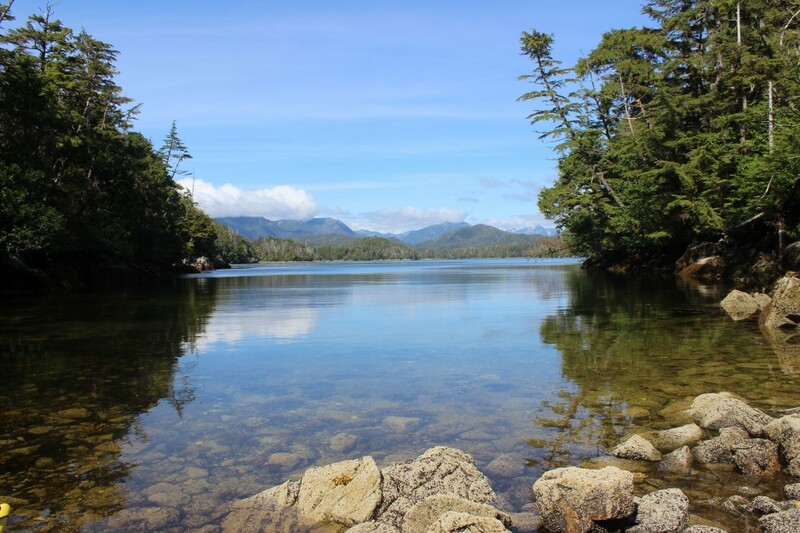 Neither the project of a non-profit nor the goal of a group of “greenies,” the proposal for the protection of this area actually came from the Sitka Chamber of Commerce. 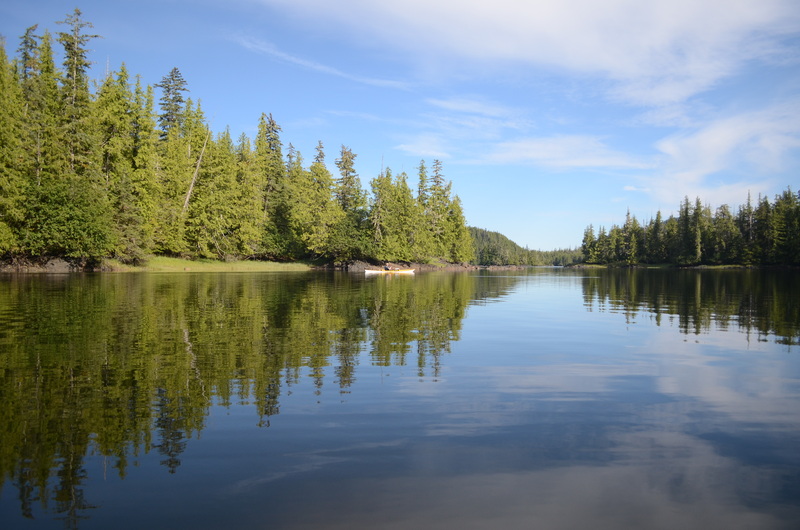 For this reason, I think that South Baranof has an important story to tell, which is that regardless of whether you’re an artist or a government employee or anything in between, there’s a role you can play in the preservation of our planet and public lands. Environmental stewardship can emanate from anywhere; caring for the Earth is not reserved exclusively for the environmentalist. 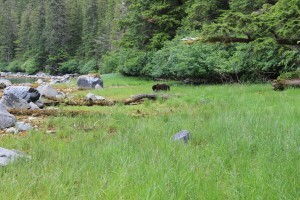 The brown bear we encountered at our first campsite. And this comes as very good news, because in recent decades – at a time when the environment has become one of the forefront social, scientific, and political issues of the day – people’s willingness to identify as an environmentalist has plummeted. In 1999, the last time that the national Gallup poll asked whether people considered themselves “environmentalists,” only 50% of respondents answered yes. Yet a related survey conducted only a few months later found 83% of respondents, a considerably larger number of individuals, “willing to agree with the goals of the environmental movement.” So what accounts for this disjunct? According to a number of social scientific studies, many people’s hesitance to self-identity as an “environmentalist,” even while agreeing with the term’s associated values, stems from the negative connotations that people believe come attached with the word. For many, the term conjures up images of tree-hugging hippies, implies privileging ecology over the economy, or suggests subscription to a larger (and liberal) agenda. I myself have encountered friends and acquaintances wary of using the term for all of the above, among other, reasons. Which is why I like the story of South Baranof. It’s a story of an environmentalism differently defined – a story of many different types of people who over the years have worked to protect the land. As a matter of fact, the first people to press for restrained logging and preservation of the Southeast’s forests were not hippies, but hunters! 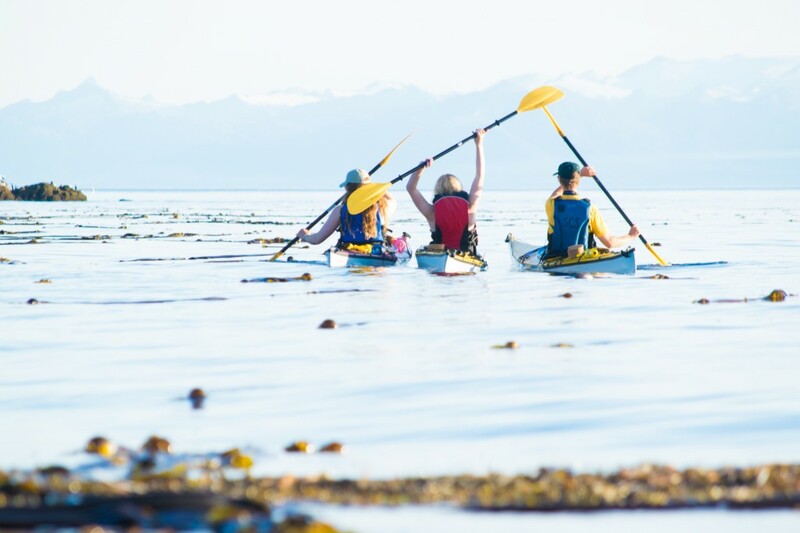 Thus, from its Chamber of Commerce creators up through its current artist, among other, stewards, the individuals responsible for the creation and conservation of South Baranof have shown that “environmentalist” doesn’t have to be a restrictive or totalizing term. Caring for the Earth can come in different forms. The American author and environmental activist Edward Abbey once advised his readers to “be as I am – a reluctant enthusiast, a part-time crusader, a half-hearted fanatic. Save the other half of your lives for pleasure and adventure.” As we continue to face growing environmental threats in the 21st century, I think the sentiment captured by Abbey’s statement is an important one: which is that caring for the earth doesn’t need to be your full time job in order to practice good stewardship. Being green doesn’t necessarily require engaging in extreme action, merely exercising a conscious ethic. So there is good news for the 66% of Americans who in 2014, in this year’s Gallup survey, admitted to worrying about the environment, which is that you can be an “environmentalist” and something else – be it an artist, or a hunter, or a town employee, or whatever job you currently hold. As the success story of South Baranof attests to, stewardship springs from many sources. You don’t have to be an “environmentalist” by trade to effect change and get the job done. One of Ray’s paintings from the trip. 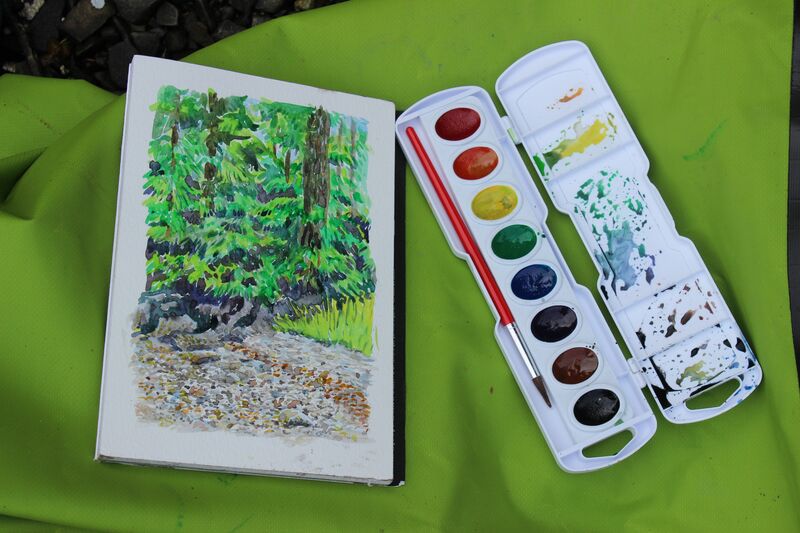 If you’re interested in learning more about or applying to a Voices of the Wilderness Alaska Artist Residency, be sure to check out the link on the Forest Service’s website. And if you’re still looking to get outdoors this summer, be sure to check out some of the opportunities provided by the Sitka Conservation Society at our wilderness page here. The artist trip may be over, but there are many more ahead! We’d love to have you involved. On Tuesday night, June 10, just over 40 people gathered at Crescent Harbor to embark on a three hour boat cruise that travelled out of Sitka Sound, all the way to West Crawfish Inlet and back. Fresh off the plane from Boston, MA, I was lucky enough to be one of those participants, and had my first real introduction to the Alaskan landscape that I will be working with closely this summer as SCS’s Wilderness Intern. We were exploring by boat the South Baranoff Wilderness Area, one of the nineteen wilderness areas that is managed by the United States Forest Service within the Tongass Forest of Southeast Alaska. 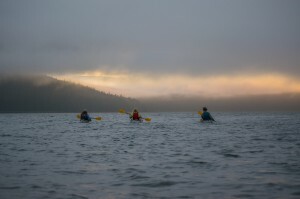 The cruise, the first of four trips being sponsored by SCS over the course of the summer, had as its educational theme the concept and land designation of “wilderness,” in honor of this year’s 50th anniversary of the Wilderness Act. A landmark moment in American history, this act, signed into law in 1964 by President Johnson after almost unanimous Congressional approval, officially recognized as important the designation and legal protection of places “without permanent improvements or human habitation” (Wilderness Act of 1964, Section 2 c. “Definition of Wilderness). Wilderness was meant to be a place where nature reigned and humans remained solely as visitors. 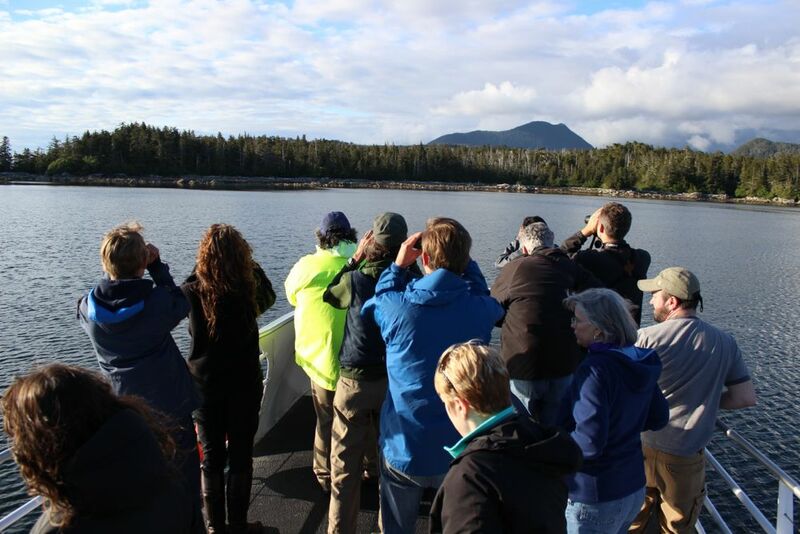 The visitors on this week’s boat tour certainly got a taste of wilderness’ wonders, catching sight over the duration of the trip of sea lions, sea otters, bald eagles, and sweeping old-growth forests of western hemlock, Sitka spruce, and Alaskan yellow cedar. About halfway through we even caught a glimpse of one of the brown bears for which Sitka, and Southeast Alaska in general, is so famous. In some ways, the boat cruise, and the natural beauty being appreciated from its decks, thus functioned as a celebration of the past – a celebration of the 50 years of committed stewardship that has kept such pristine places intact, and preserved them for the enjoyment of future generations and those who have yet to behold the natural splendor of Alaska. 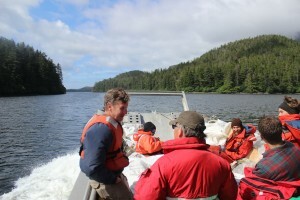 Cruise participants look on at a brown bear from the deck of the boat. But even as it commemorated past achievements, the tour also served as a stark reminder that the battle for the protection of wild places is not yet over. As of only a few months ago, a Department of the Army permit was issued for work in the waters of Crawfish Inlet – the very inlet to which our cruise had come. 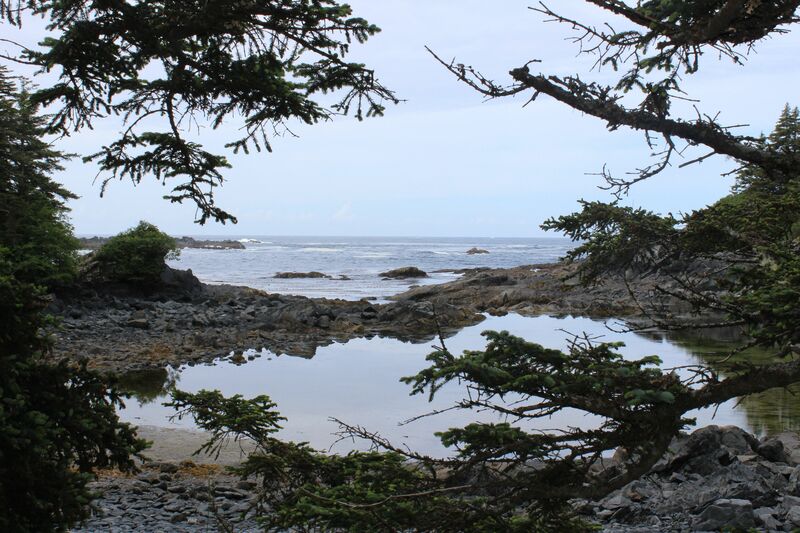 The permit will allow the Northern Southeast Regional Aquaculture Association (NSRAA) to moor structures and store net pens in the inlet, which stands to interfere with the current use of these woods and waters for subsistence, recreation, and tourism operations. The land’s “outstanding opportunities for solitude,” one of the quintessential pillars and promises of wilderness areas, will no doubt also be negatively affected by the presence and operation of these large, metal enclosures. Fish are a fundamental part of the Southeast’s ecosystem, economy, and identity. And as such, they are a vitally important and valuable resource. But in a landscape that has so much to offer, we must be careful not to manage one resource – fish – at the expense of another – wilderness. The boat cruise, filled to capacity Tuesday night, stands as a testimony to how many people put value in the existence of these wild waters and forests of Alaska. Which is good news – because even 50 years out from the designation of the Wilderness Act, there clearly remain many natural and wild landscapes still in need of defense. Information on the other boat cruises being offered by SCS this summer can be found on our website. And for a glimpse of even more Alaskan wilderness, be sure to check out The Meaning of Wild, a 30-minute documentary that brings you deep into some of the most remote areas of the Tongass. Interested in getting out there yourself? 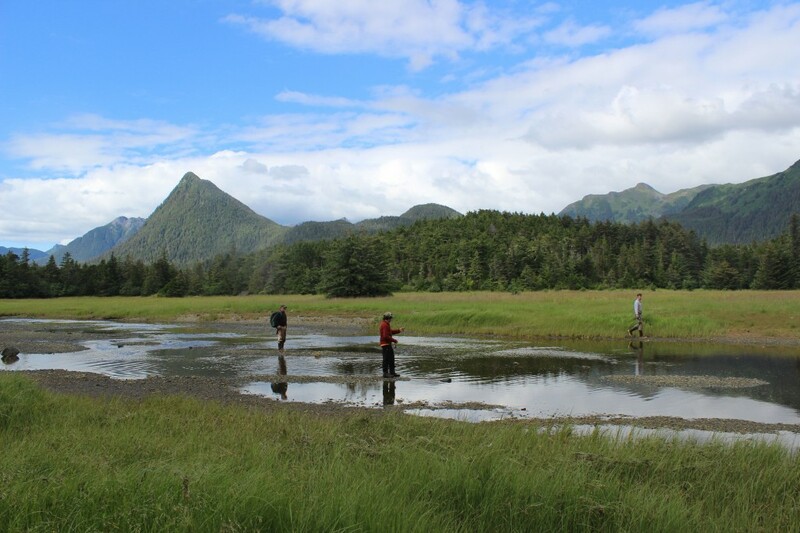 Head to SCS’s Wilderness page where you can learn about opportunities to volunteer for the Sitka Conservation Society and explore remote and beautiful places all while making a difference!